Solgar Earth Source Multi-Nutrient health supplement tablets provide Vitamins, minerals, antioxidants, whole food concentrates, digestive enzymes and Potent herbs. 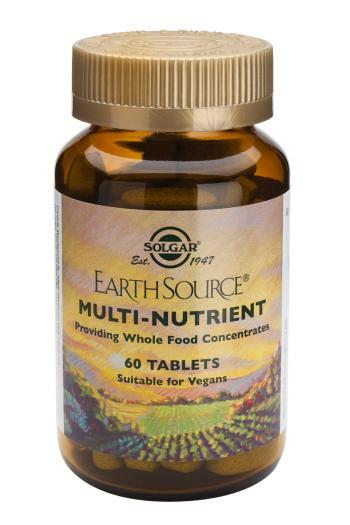 Solgar Earth Source Multi-Nutrient tablets are an advanced formula providing Vitamin and Mineral Complexes with Antioxidants, Whole Food Concentrates, Digestive Enzymes and Full Potency Herbs. As a food supplement for adults, three (3) Solgar Earth Source Multi-Nutrient tablets daily, preferably at mealtime, or as directed by a healthcare practitioner. microcrystalline cellulose, hydroxypropylmethyl cellulose, cellulose gum, silicon dioxide, magnesium stearate, mixed tocopherols, hydroxypropylmethyl cellulose, vegetable glycerin, copper complexes of chloropyllins, cellulose.